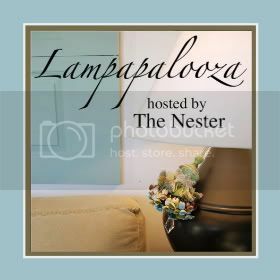 Today is Nester's Lampapalooza Party. Here's what I've got to show you . . . Here's the thrift store lamp I bought for a couple bucks. This picture does not do its ugliness justice. A couple coats of oil rubbed bronze spray paint, add a new lampshade from my closet, throw a tassel at it . . . I love it, but I hated the chain. I really wanted to sew one of those cute cord covers but didn't have time. So I broke out the hot glue gun. I cut a very long piece of extra fabric I had sitting in my "to do" pile, and I glued that sucker right on. Well, I didn't actually glue it to the chain, but I did fold a little hem and glued that. Then I slipped it on the chain. Can't even tell, can you? My one piece of advice if you try this is, try to go light on the hot glue. It's difficult to get the fabric to bunch up naturally if there is too much glue on it. 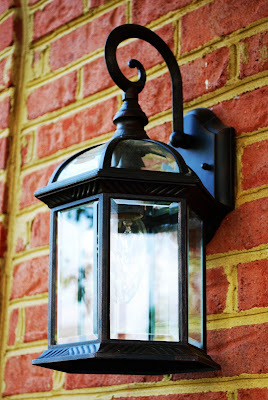 Mr. Jones replaced the nasty builder-brass lights out front. They were pretty cheap, and it made a huge difference. For more Lampapalooza, stop by Nesting Place. oooo! I love them all, but especially that one you painted black. Simply lovely. Hey I like what you did with your lamps! I love the tassel on the one lamp so cute! Your lamps are lampilicious, Mrs. Jones!! I really love what you've done with that floor lamp! Love them all. The chain cover looks great! I love them all, but the chandelier trick is great. LOVE LOVE LOVE the lamps, esp. the cord cover on the chandy. So glad to see you get some kudos from the Nester too! Great job! Your spray lamp looks fantastic!! Great job! And thankyou for the hot glue idea on the chandy chord cover. I need one of those, as well, but haven't found time to *attempt* to sew one. Very smart! Love your header! And the chandelier just looks amazing, I really like the cord cover, beautifully done. Gorgeous lighting! The first one is my absolute FAVE. What a transformation. The wondrous abilities of spray paint never cease to amaze me. I love your big bathroom. Great post! oh your lamps are great! Great job!! As soon as I saw the first lamp photo I thought, she should paint it black... and you did! It looks fantastic, I also love the slip cover for the chain. pandora charms hopes that these absolute boutique fits can advice to accompaniment the contour of an absolute abundance and accommodate a belvedere for adopting the acquaintance of Pandora. In 2009 you should see added and added retailers opting to cast a area of their abundance to alone retail Pandora.